Employed Koreans earn W3.29 million a month on average, but men make 1.7 times more money than women and staff in big businesses 1.8 times more than in small firms, according to a survey of 1,500 salaried workers by Statistics Korea on Thursday (US$1=W1,143). The median income amounts to only W2.41 million a month, but the average salary is W880,000 higher the medium income because of a small number of ultra-high earners. Baek Woong-ki at the state-run Korea Development Institute said, "As technology develops rapidly, managers and skilled workers reap most of the profits, while unskilled workers are left out." The OECD classifies the middle class as people whose monthly salary stands at 15 to 150 percent of the median income, which means 56.4 percent of Korea's salaried workers are middle class. In global comparison, Korea ranked 23rd among 35 OECD member nations last year, while their average annual salary stands at US$29,125. The gap between the salaries of men and women remains the widest in the OECD. The average monthly salary of male workers stood at W3.9 million, but that of women at only W2.36 million. 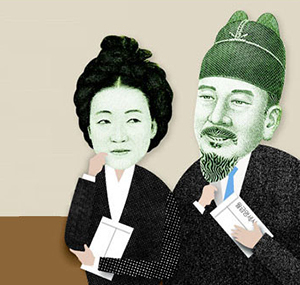 Global consulting company PwC surveyed 33 out of 35 OECD member nations this year and found that Korean women earn only 64 percent of wages paid to men here, but the government study shows an even bigger gap. The main reason is a pay system in Korea that reflects the number of years of someone has spent working in a company, and since women tend to spend less time in the same job, be it to have children or for other reasons, it puts them at a disadvantage. According to industry tracker CEO Score, men worked on average 12.9 years in the same company and women 8.3 years. As of 2015, 40.2 percent of female workers were on temporary or part-time contracts, compared to just 26.5 percent of men. Wages also varied according to the size of companies. In big companies employing more than 300 workers, staff earned W4.32 million a month, but in small businesses with less than 50 staff only W2.38 million. Banks and insurers paid the highest wages with a monthly average of a whopping W5.78 million. The lowest pay was in the restaurant and accommodation business at W1.73 million. Cho Joon-mo at Sungkyunkwan University said, "Focusing simply on job growth can lead to the creation of low-quality jobs, so we need to boost the number of quality jobs by easing regulations for new businesses."